Dear Sai Readers, i hope you had grand diwali celebrations with your near and dear ones. Since i am writing this post, your guesses that i am back from Shirdi are totally correct. You must be thinking why i always write every detail of my Shirdi trips. The reason is that every Shirdi trip has a unique divine experience. On each visit, we get such experiences that we feel it was better than the previous one and these visits to this Holy Town become memories. Memories are like sand on sea-shore which will be washed away with waves of time. I do not want to loose any such divine memory and by writing down every detail of my Shirdi trips on this blessed blog, i am trying to make a permanent record. This life is short and at the age when i would not be able to go to Shirdi due to this transient and ever fading human body, i would refresh my memories by reading these ready details noted in my young age. I guess, one will certainly find me with thick glasses on my eyes, surrounded with all Sai Baba books and printed notes of my Shirdi trips. I apologise you for getting off the topic but sometimes waves of thoughts take us too far and i just penned down my few thoughts to share them with you all. With the above introductory note, now please allow me to narrate divine experiences of our Diwali celebrations at Shirdi. This time, i was called to Shirdi with no plans to go. While posting photographs of Punyatithi Celebrations 2010 at Shirdi, my heart longed to go to Shirdi from deep within. The same day, Baba fixed my plan to visit Him. 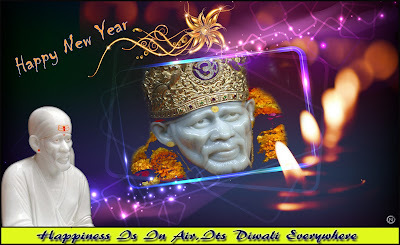 We reached Sirdi on Diwali day (November 5, 2010) morning and we booked ourselves in Dwaravati guest house of Shri Sai Baba Sansthan Trust, Shirdi. Our schedule for Diwali day in Shirdi was planned by Lord Baba from our first visit on Diwali and the same happenings are repeated every year. This time also the same followed. We first had our lunch in Prasadalay. Thenafter we came to Samadhi Mandir. First we submitted our envelopes with some money packed in them for Laxmi Poojan being Diwali day and then proceeded towards Samadhi Mandir. It was afternoon and thus crowd was comparatively less. We could directly reach main Samadhi Mandir hall within few minutes. The Samadhi Mandir was echoing with cries of "Shri Sachchidanand Sainath Maharaj Ki Jai". I was just gently looking at sweet face of Lord Baba. He was smiling as if welcoming us to His home. Though i had bunch of prayers in my hand and wanted to say so many things to Lord Sai, i was speechless in front of Him. The glow on His face was enhancing that it can easily attract anyone's attention to make him/her speechless. Due to less crowd glass covers around Samadhi were removed and we could freely touch Samadhi of Lord Sai. I took prayers with me and gave them to the priest. The priest returned all of them with a rose to me and thus i presumed that prayers were accepted. As said earlier that rush was nominal we got two more chances to have darshan in Samadhi Mandir. Fully satisfied with the darshan we had at Samadhi Mandir, we went to Dwarkamai. This Mother Mosque also had moments of ecstasy reserved for us. We lined up in queue not very far from gate of Dwarkamai and quickly headed forward. The upper level of Dwarkamai - the permanent abode of Lord Sai was open. We climbed steps and reached near sacred fire 'Dhuni' and saw its flames through iron cover. Before Punyatithi 2010, a devotee of Lord Baba has donated white marble and it was installed in Dwarkamai. Then we came near Padukas and live portrait of Lord Sai. I left bunch of all prayers near the portrait and asked Him to accept all prayers. We then alighted at lower level of Dwarkamai and sat in a corner of the common wall of Dwarkamai and Samadhi Mandir. Laxmi poojan started and so darshan queue was stopped and there were very few devotees in Dwarkamai. The security guard seeing us seated in small space, opened lock of iron bar and allowed us to sit in middle of Dwarkamai. One can literally feel that he/she is seated in mother's lap while sitting in Dwarkamai, the same was our feeling. Few months back Lord Sai had inspired us to work on a unique write up for this blog. I had carried my diary and reference books to work on this write up while i was in Shirdi. I found enough space to sit in Dwarkamai and quickly took out essentials from my handbag to pen down the write up. The topic and its contents will be released soon, but at this point of time i feel it must be under-cover. At about 5:45 PM priest came with earthen pot with handle. The iron door of 'Dhuni Maa' was opened and few burning fire-woods were kept in that earth pot. The priest then quickly headed towards exit gate with pot and vapours of burning firewood above it. I noticed this and grabbed the opportunity to touch live embers. Believe me i was not scorched even though burning firewood was taken out from Dhuni just a few seconds back!!! Soon Dhoop arti started and we all chanted the arti while sitting in Dwarkamai itself. I had my eyes closed even though i could see Samadhi mandir live captures in front, Lord Sai's live portrait on my left and another portrait of Lord Baba sitting on stone to my right. In fact i could visualise Lord Baba giving blessings with both hands and seated as usual. 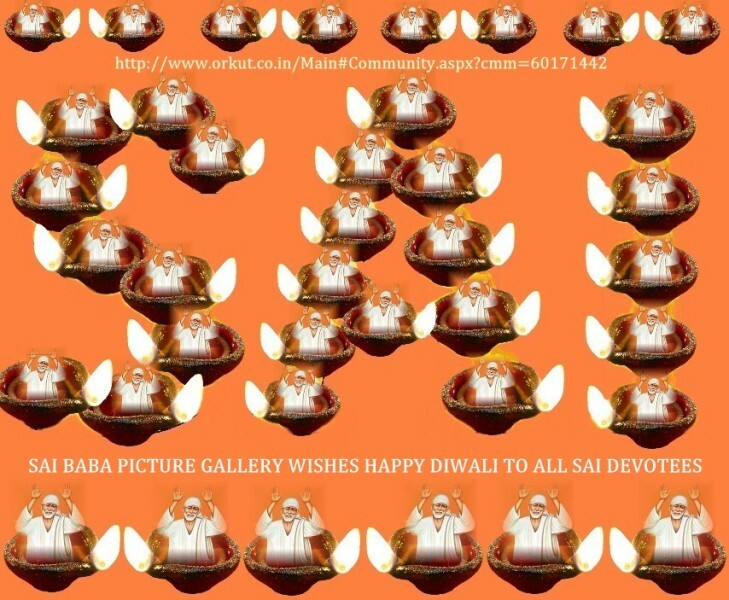 Lord Sai was smiling with great happiness to see His kids near Him. With such inner joy, i chanted whole arti and opened my eyes when "Shri Sachchidanand Sainath Maharaj Ki Jai" was heard. Now as arti was over it was time to leave Mother Mosque's lap. It was getting dark and so the time to light diyas in Nand-deep was nearing. We all went there with diyas, rangoli and candles. On reaching at the spot, we found many diyas and candles already lit, thus making the environment full of lights. We somehow managed to find some space near well in Lendibaug and lit few candles and diyas. After dinner myself, my mother and her sister decided to stay back and others took leave to take rest. Three of us now again went to Samadhi Mandir and had blissful darshan two more times. While we were in main hall of Samadhi Mandir the second time, it started raining heavily. We got tensed since we thought that we may get wet in rain. But before we came out rain stopped making easy for us to reach our rooms and take rest to get refreshed for next day. Next day was more exciting and blessings of Lord Baba were clearly seen. Sometime back we had heard about Meher Baba and now we wished to visit Holy Samadhi of this personality in Ahmednagar District at a village called 'Meherabad'. It was very cool, calm and mesmerizing environment there. Foreign devotees were serving as volunteers and to the surprise of all, there was not a single Indian serving there. Shirdi, as we see today has become very crowded and everywhere we see people while this place was very quiet with few people. We all queued up and bowed to Samadhi. We all did not know much about Meher Baba, but with His and Sai Baba's grace we found few dedicated devotees of Meher Baba who gave us some information about this incarnation of God. They guided us about the way from where we can get books on Meher Baba. We all purchased few books from the only shop and proceeded our journey to Nimongaon. Nimongaon is the village where Nanasaheb Nimonkar's descendants live. We had chance to meet grandson and great grand son of Shri Nimonkar. Also we were fortunate to touch Holy Padukas which were given by Lord Sai Baba Himself to Shri Nimonkar to be kept in shrine. The Padukas emitted strong fragrance of Kasturi and Chandan which lasted long on our hands. We were given Maharashtrain snacks as it was occasion of diwali and grand son of Shri Nimonkar who is 94 years of age now, himself put sweets in our mouths. He was overwhelmed by our visit and had tears of joy which wet our eyes too. We were surprised to know that at this old age, grand son of Shri Nimonkar do not have glasses nor does he suffer from any disease. Even he does all his daily chores himself without anybody's aid. After capturing few snaps with grand son of Shri Nimonkar, we left happily for Sakori, a land treaded by Shri Upasani Maharaj. There also we experienced and enjoyed peaceful atmosphere. After returning to Shirdi, we took our dinner and since we did not go to Samadhi Mandir for darshan that day, we opted to attend Shej arti and enjoyed it to our heart's content. The next day was departing day and crowd of devotees had increased much. But Lord Sai has one more Leela and blessing in store for us. Since it was departure day we went to Dwarkamai for last darshan to get permission to leave. Mother Mosque was also crowded with long queue, but we patiently headed. The upper level was closed due to rush, so we had chance to just be present in Dwarkamai. We reached near stone where Lord Baba used to sit and meditate. I saw two shawls - orange and green lying at the glass which covers the stone. I did not notice anyone claiming them their own, so i asked security guard standing there if we can take shawls, she nodded yes. It was prasad for us from Lord Sai and we were very happy to receive it in Dwarkamai. The day before we had visited Shri Nimonkar's descendants house and they had told us that they will be coming to Shirdi and would love to meet us again. The flag over Dwarkamai was supplied by Shri Nimonkar when he was alive and now this is provided by his descendants on every Ramnavami. But the flag gets untidy in the span of a year, so sansthan had requested them to provide one more flag for Dwarkamai which is replaced on Padva day (second day of Diwali - Padva called in Marathi). They came near Chawadi - Lord Sai Baba's resting place and we were standing there only. Meanwhile Shri Anil Bhojani also turned up. Soon then Madhyayan (noon) arti started. We all rushed in Chawdi and attended arti there. A post - Introduction - Gujarati Book "Guruwar Ni Palkhi - Itihaas Ane Vartmaan" was published sometime back on this blog. Shri Anil Bhojani had been intrumental in publishing this book and he had a copy in his hand. He kept that copy near Lord Baba's portrait and it remained there till arti finished. While arti was going on Shri Anil Bhojani got hint from Lord Baba that this book must be given to my father. Also Shri Nimonkar's great grand son has noticed that book and wished that since we were devotees from Gujarat and the book is in Gujarati, it must be given to my father. After arti was concluded, Shri Anil Bhojani handed over the book to my father and asked him to keep the book in our shrine. After we all gathered near Chawadi again, Shri Nimonkar's great grand son revealed to all of us what was going in his mind during arti and now his thoughts were taken into action by Shri Anil Bhojani. Thus Lord Sai Baba blessed us with a book to be worshiped from now. With such blessings and grace by Lord Sai Baba we returned totally content and more thirst to visit this place in evening.